More nimble than industry heavyweights, but packing more punch than many smaller firms, the mid-sized brokerages on this year’s ranking acted as change agents in the industry. Like last year, the lineup of mid-sized Manhattan residential brokerages experienced a massive shift this year. The change-up came as well-established firms saw their fortunes turn and as newcomers changed the landscape of the Manhattan market. 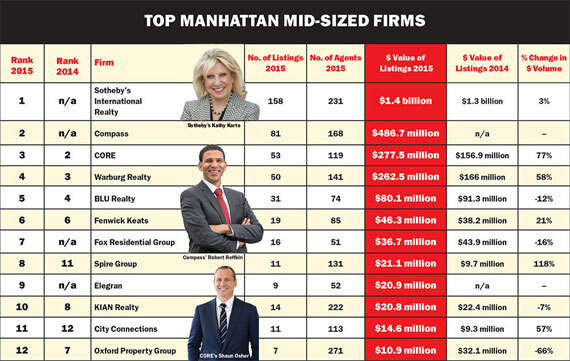 The ranking is The Real Deal’s third annual survey of Manhattan’s mid-sized firms and only includes companies with 50-plus agents that didn’t make the biggest firms list. This ranking is done by dollar volume of active listings, which were collected by TRD from listings provider On-Line Residential on March 29 as part of a one-day snapshot. This year, the top two firms — Sotheby’s International Realty and Compass (formerly known as Urban Compass) — prompted a recalibration of the middle segment of the market. Those companies were followed by CORE, Warburg Realty and BLU Realty. The tony Sotheby’s, which dropped off TRD’s list of largest Manhattan firms, had a massive $1.4 billion worth of sales listings — up from $1.3 billion a year earlier. While the firm outperformed a number of brokerages on the biggest firms list, and had hundreds of millions of dollars more in listings than its mid-sized counterparts, it landed on the mid-sized list after seeing its agent count drop more than 15.5 percent, to 231 this year. The firm’s priciest listing, marketed by veteran high-end broker Serena Boardman, is a 9,000-square-foot duplex at One Beacon Court; that penthouse is on the market for $82 million. Boardman also has the listing for a duplex at the Pierre Hotel, at 795 Fifth Avenue, that’s asking $70 million. Meanwhile, agent Nikki Field is marketing a $66 million penthouse at Jared Kushner’s Puck Penthouses, at 293 Lafayette Street. Nabbing the No. 2 spot, Compass — which is backed by more than $70 million in venture funding — cracked TRD’s ranking for the first time this year. It had 168 agents and racked up $486.7 million worth of listings, including 71 Franklin Street, a mansion that’s asking $65 million. Top broker Leonard Steinberg, who is also Compass’ president, has that listing as well as one for a $46 million townhouse at 2 North Moore Street in Tribeca. Of course, Compass made waves when it hired Steinberg from Douglas Elliman in 2014, and it has continued to turn heads with other high-profile hires, including Kyle Blackmon from Brown Harris Stevens, Roy Kim from Extell Development and Eugene Litvak from Citi Habitats. The firm lured more than 50 hires from the Corcoran Group alone, including managers Gene Martinez and Patrick Brennan, along with agents Lindsay Barton Barrett, Debra LaChance and others. CEO Robert Reffkin said Compass jumped into the market in 2013 determined to upend the status quo by offering new technology for its agents. Together the top 12 mid-sized firms held $2.6 billion worth of active listings — far more than that the $1.1 billion that last year’s mid-sized companies racked up. But much of that increase is thanks to Sotheby’s presence on the list. As the market shifts, the challenge for mid-sized companies is to adapt to the ever-changing Manhattan landscape. CORE, which rounded out the top three on this year’s ranking, is seeing its star rise, after Related Companies acquired a 50 percent stake in the firm this past fall for an undisclosed sum. “It’s a huge game-changer for us as a company,” said CORE’s CEO Shaun Osher. Going forward, CORE will collaborate with Related on the development and sales of its residential projects. The firm had 119 agents as of March 29, up from 78 last year. In addition, CORE snagged $277.5 million worth of sales listings, up from $156.9 million in 2014. Meanwhile, Warburg, which ranked No. 4, is in the midst of a major rebranding under the direction of Fred Peters, president, and his daughter Clelia Peters, who came on board last year as Warburg’s director of strategy and innovation. “It’s an interesting challenge to figure out how most effectively to compete if you are, like me, a relatively small brokerage, and you actually want to run a business that’s cash positive,” Fred Peters said. Warburg had $262.5 million in sales exclusives, up from $166 million last year, according to TRD’s analysis. The firm’s two priciest listings are a duplex at the Eldorado, at 300 Central Park West, that’s asking $29 million, and a 12-room co-op at 998 Fifth Avenue that’s listed at $28 million. Other firms popped on and off of this year’s mid-sized ranking. For example, Stribling & Associates, the top firm on last year’s mid-size list, once again catapulted back onto the biggest-firms ranking with 281 agents and $694 million in listings. Platinum Properties, which ranked No. 5 last year, now appears on the boutique ranking because its agent head count fell to 36 from 68. Founder Barbara Fox noted that because TRD’s ranking only factors in sales listings, the firm didn’t get credit for all of its buyer-side deals. “That’s what a small brokerage does,” said Fox, who represented the buyer of a $16.5 million condo on Park Avenue last year. She also represented the buyer of unit 7K at Extell Development’s One57, which went for $30 million, she said. Of the firm’s overall drop in listings, Fox said she personally did less business over the past 12 months because she was focused on renovating the firm’s new office at 14 East 60th Street. Of all the mid-sized firms on this year’s ranking, Spire Group saw the largest increase in the dollar volume of its active listings. Kevin Kurland’s 100 percent-commission firm, which launched in 2011, had $21 million worth of listings, compared with just $9.7 million in 2014. At the same time, the firm’s agent count dropped to 131 from 161. As in previous years, firms that were lower down in the ranking were dogged by a lack of Manhattan residential inventory, which translated to fewer listings but a faster pace of closing deals. Clocking in at No. 5, BLU Realty had 31 listings, worth $80 million, compared with last year’s 22 listings, worth $92 million. “Over the last month and a half, we have a lot of accepted offers and contracts out,” said BLU founder David Tobon. After a slow third and fourth quarter last year, Tobon said his agents are starting to do more deals. “We definitely [have seen] more bidding wars” recently, he said. Other newer firms, which debuted in the wake of the recession, saw mixed results in 2015. KIAN, founded in 2011 by Charles Doolan and Jae Muk Chung, attracted more agents — some 222 this year compared to 172 last year. But listings dropped to $20.8 million from $22.4 million. KIAN’s sweet spot, between $800,000 and $2.5 million, has been particularly strapped for inventory. “There’s too much of this ultra-luxury happening,” Doolan said.